Even as the U.S. becomes a polylingual society, public opinion continues to favor a special status for English. 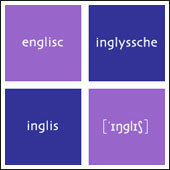 In a Rasmussen Reports poll of adults in the U.S., 85 percent said English should be the nation’s official language. Respondents under age 40 were a bit less inclined to share this view, but a large majority of them (78 percent) did so. Similarly, while there was above-average support among whites for making English the official language (88 percent), it also enjoyed strong support among non-whites (76 percent). As people increasingly accept the multicultural reality of modern life, we can surmise they also feel some urgency about sustaining a common language.